← Whole Earth Center Hits 45th Anniversary – Showing Localism Can Win! 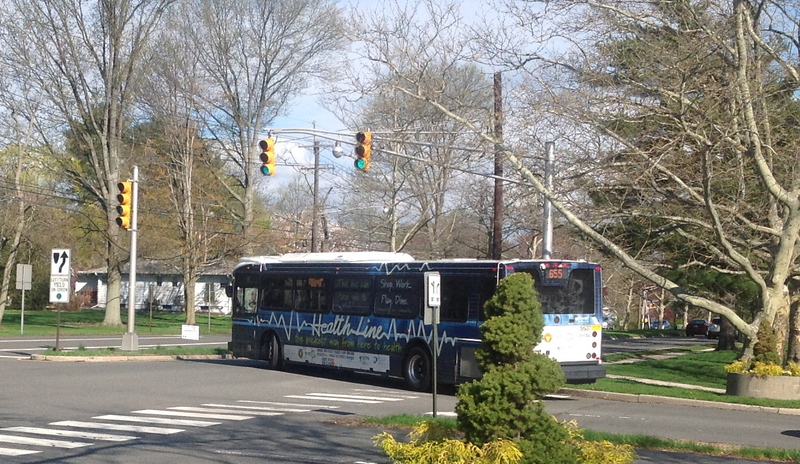 The #655 ‘HealthLine’ bus, seen here in Princeton, is facing the ax in NJ Transit cutbacks (click to expand). This week, NJ Transit announced fare hikes and service cutbacks. Among all the bus lines in New Jersey, the only year-round daily service that is getting the chop is our #655 service between Princeton and Plainsboro. The #655 line was launched in 2012, with support from six funding partners including Princeton Healthcare System and Princeton University. It was intended to provide a transit link to the new hospital, and also provided a link between Princeton and residential areas of Plainsboro. But the bus line has reportedly struggled for ridership, and now faces termination. How is it possible that the #655 hasn’t worked out, given Princeton’s stated dedication to transit? On the face of it, the #655 route should be a winner. Princeton and Plainsboro are both relatively densely-populated areas for the region, and the hospital ought to be a significant traffic generator. The line is also a relatively ‘straight shot’, and doesn’t suffer from the tortuous routing of other local bus services. It goes from downtown Princeton to the new hospital site in Plainsboro in just 17 minutes, which isn’t much slower than a car. The bus line had its own dedicated, splashy website, the route was recently updated to serve more passengers, and free rides were even offered to try to attract new riders. It’s hard to imagine what more could have been done to drum up customers. The fact remains, however, that it is just as easy, and quicker, to take a car instead of the bus. There are no significant obstacles to replacing a bus journey with driving. Even though the bus fare is pretty cheap ($1.50 one-way), the marginal cost of driving is next to nothing. Parking is easy in Plainsboro and at the new hospital, and despite all the moaning you hear about it, there are few places in Princeton that are more than a 10-minute walk away from a free parking space. The #655, by contrast, only runs at a maximum frequency of once every 45 minutes. Unless you are lucky, or punctilious about timing, it is quite possible to be waiting for 3o minutes for your ride. These challenges are not unique to the #655 bus service. It is very hard to provide a frequent bus service in a region with low overall population density, and amenities that are spread out. Local land use strongly incentivizes car use, and even though everybody complains about traffic, there are few people who are willing to switch their car trip for transit. 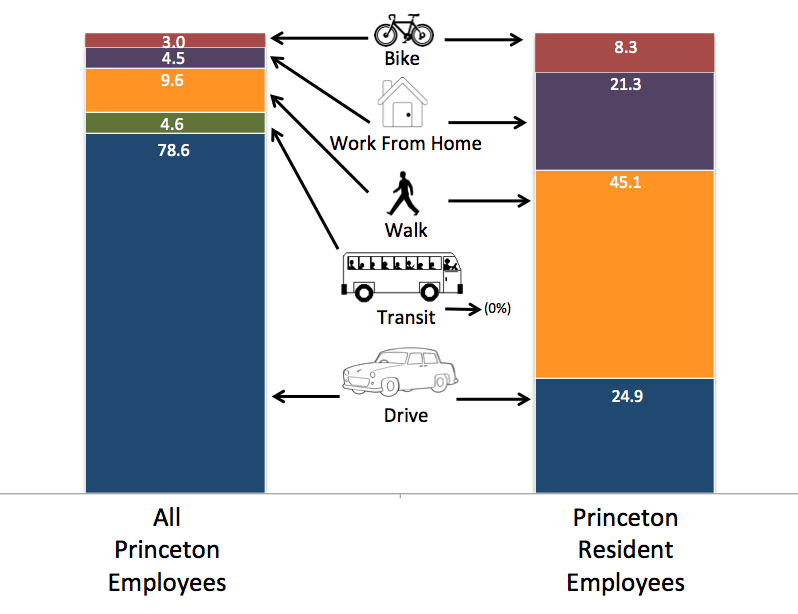 Less than 5% of Princeton’s daily workforce uses transit as a primary means of getting to work. Given the current funding situation at NJ Transit, it’s hard to see where the next investment in new routes is going to come from. While fighting for the best transit possible, we also have to be realistic about the resources that are necessary to run a good service. The cancellation of the #655 is not yet final, and our elected officials in particular have an opportunity to prove their commitment to transit by saving it. If they can’t do that, then it is questionable how serious we are about using transit as a means to solve our traffic woes. We have to consider the full menu of options to combat car dependency, and also recall the recommendations of the Route 1 Growth Strategy, which specifically called for changes to land use to make it easier to run efficient transit- changes which so far have not been implemented. This entry was posted in Alternative Transportation, planning, Princeton, Smart Growth, Traffic, Transit and tagged nj transit, planning, Princeton, Transit. Bookmark the permalink.